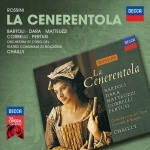 This is possibly the most famous Cenerentola recording of all time and definitely one of the best. Riccardo Chailly conducts a nearly note-complete rendition of the score (only the three numbers by Agolini are missing) with all the light, scintillating charm and buffa energy that a Rossini lover could hope for. His reading is brisker and less sentimental than others, highlighting the opera’s comedy more than its morality tale, but it still has enough warmth and tenderness to make the heart of the piece shine through, and its joyful vivacity is infectious. Cecilia Bartoli’s Cenerentola sparkles from beginning to end. With her warm, earthy yet youthful timbre and effortless, effervescent coloratura, she creates a thoroughly endearing portrait of a sweet yet spunky heroine. Equally excellent is Alessandro Corbelli’s near-peerless Dandini, rich and agile in sound and impeccable in wit, as is the velvet-toned Alidoro of Michele Pertusi. Enzo Dara, late in his career, sings Don Magnifico with a slightly thinner tone and heavier vibrato than other basses, but still with the resonant, bouncing timbre, outstanding patter and flair for humor that made him a world-renowned basso buffo. Fernanda Costa and Gloria Banditelli likewise bring comic flair and strong singing to the roles of the stepsisters. The cast’s only semi-weak link is the Don Ramiro of William Matteuzzi, whose tenor is fairly dry and tart-timbred, though appropriately agile and bright. While not the only good Cenerentola, this is still an outstanding version. Its wide availability in public libraries is a real blessing, because it would make a first-rate introduction to the opera for newcomers. Without question, it’s near the very top of my list of Rossini recommendations.